An on-the-ground look at wind energy’s arrival in the American heartland and the hopes it brings for economic prosperity--as well as our national security and our planet’s survival. 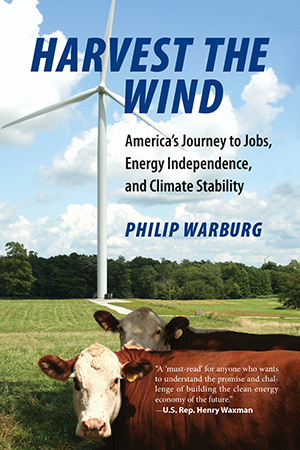 In Harvest the Wind, Philip Warburg tells the story of America’s energy future as it has not been told before. Cloud County is home to the Meridian Way Wind Farm, whose turbines are boosting farm incomes and bringing green jobs to a community that has watched its children flock to more exciting lives and less taxing jobs elsewhere. This remote corner of Kansas is the first stop on an odyssey that introduces readers to farmers, factory workers, biologists, andhigh-tech entrepreneurs--all players in a transformative industry that is fast taking hold across America and around the globe. Warburg describes America’s race to keep pace with competitors in China and Denmark, and looks closely at the health and environmental concerns that have aroused some angry wind-farm neighbors. He also describes what it will take to make wind energy a serious alternative to conventional fuels and nuclear power. Warburg draws from his work as a lawyer and policymaker on energy and environmental issues, and on his skills as a journalist to convey the human side of a story about bringing the American heartland back to life. Then came the Arab oil embargo in 1973, which created panic at the gas pumps and set Washington abuzz with debate about the need to wean America off foreign oil. After college, I joined the energy staff of Senator Charles “Chuck” Percy of Illinois, a former corporate CEO and a Republican who took a pragmatic, bipartisan approach to promoting energy conservation and fossil fuel alternatives. President Jimmy Carter was a willing ally, laying out an energy program aimed at providing 20 percent of America’s energy needs from solar, wind, and other renewable resources by the year 2000. As far-fetched as that goal seemed at the time, Congress got behind a number of measures to support investments in renewable energy projects, including wind farms. Investing in wind energy will not bring an end to Middle East strife, but it can begin to wean our nation off the fossil and nuclear fuels that we have come to associate far too closely with American prosperity. Now is the time to reshape our energy economy. With wind, we can tap an inexhaustible domestic energy resource while showing that America finally is willing to join--and even lead--the battle for climate stability.